Noon: Command passed the Crow’s Nest and crossed the Divide. There is substantial testimony that the time for this event was significantly earlier. 12:05: Command at Halt 3; General George Custer assigned the battalions. This is 2nd Lieutenant George Wallace‘s Halt 2, about 1/2 mile west of the divide. Captain Thomas McDougall (left) [in Reno Court of Inquiry: Proceedings of a Court of Inquiry in the Case of Major Marcus A. Reno (RCOI)] stated, “On June 25th, about 11 o’clock a.m., I reported to General Custer for orders. He told me to take charge of the pack train and act as rear guard.” If Wallace’s watch (itinerary) was set to Headquarters St. Paul time — and 1st Lieutenant Edward Settles Godfrey said definitely that “Our watches were not changed (RCOI)” — Wallace’s 12:05 is approximately = 10:45 local time, within 15 minutes of McDougall’s recalled 11:00. Cf. Friedman, recalled time is accurate within one hour excluding the possibility of chance in Memory & Cognition 15.6 (1987): 518-20. 12:12: Custer-Reno battalions left the divide halt to descend to Reno Creek. Captain Frederick Benteen‘s battalion left the divide halt on an off-trail scout to the left. It is unlikely that all three columns actually set off at precisely the same time but the impact is only a few minutes. 12:32: The pack train left the divide halt on Custer’s trail. 1:20: Benteen’s battalion arrived at upper No-Name Creek and turned down it. On a high ridge ahead, 1st Lieutenant Francis Gibson (left) found the Little Bighorn valley empty. Many years later Lt. Gibson expressed doubt that he had actually viewed the correct valley (see interview with Camp). 2:00: Custer-Reno battalions passed No-Name Creek. Reno was called to the right bank. Sergeant Daniel Kanipe and 1st Sergeant John Ryan, as well as Reno, say Reno was called to the right bank near the Lone Tepee. This subtracts a mile from Gray’s itinerary. 2:15: Custer-Reno battalions passed the lone tepee. Custer’s battalion left down the right bank of Reno Creek. The scouts reported Sioux in the Little Bighorn Valley. Custer ordered Reno to lead out at a trot. 2:17: Boston Custer trots ahead of the pack train to overtake Custer. 2:32: Benteen’s battalion arrived at Reno Creek, 1/4 mile above the mouth of No-Name Creek. They saw the pack train 3/4 mile above. Boston Custer joins them. Benteen (The Custer Myth , p. 180) recalled being at the morass at 1:00 p.m., Godfrey thought 2:00. Assuming Hutchins/Knipe are right about the location of the morass, it is near the mouth of the South Fork. 2:37: Benteen’s battalion reached the morass to water the horses. Boston Custer trotted on. 2:43: Custer’s battalion trotted to the flat right behind Reno. The scouts reported the Sioux were alarming the village. Reno was ordered to charge taking Adjutant William W. Cooke (left). Custer sent two scouts to the bluff who joined Reno. 2:45: Boston Custer passed the lone tepee. 2:47: At the North Fork, Reno’s battalion crossed to the left bank of Reno Creek. 2:51: Custer’s battalion made a fast walk to the North Fork and halted to water. 2:53: Reno’s battalion crossed to the left bank of the Little Bighorn River at Ford A where it halted to water the horses and reform. The troops and the scouts saw the Sioux attacking. 2:55: Cooke left to report to Custer. 2:57: Benteen’s battalion departed the morass as the packtrain arrived. The packtrain halted to water and close up. 3:01: Cooke reported the Sioux were attacking Reno. Custer’s battalion started down the right bank of the Little Bighorn River, leaving the north fork of Reno Creek. 3:03: Reno’s battalion left Ford A and started its charge down the left bank of the Little Bighorn River. If Reno crossed Reno Creek near the Lone tepee at 2:00 according to Wallace’s watch, he was about 3-3.5 miles from Ford A. The column proceeded at a trot or “slow gallop” for 15 minutes, again according to Wallace. This would cover about 2 miles at 7.5-8 mph. Wallace said Reno was ordered to attack about 2:15. He took the gallop and covered the remaining mile to the river in about 5 minutes (gallop 9-11 mph in Upton, 1 mile in 6 minutes according to Cooke), and crossed at Ford A at 2:20 in Wallace’s recollection. Using Anders’/Graham’s 1 hour 20 minute difference between local time and official Headquarters time, then Reno crossed Ford A near 1:00, consistent with recollections of Interpreter Frederick Girard, Acting Assistant Surgeon Henry Porter, Kanipe, and Taylor. Gray added 43 minutes and at least two miles between Reno’s crossing of the creek and fording the Little Bighorn. 3:05: Reno’s battalion saw Custer or the scouts on the right bank bluff. 3:10: Pony captors leave the Reno charge to capture Sioux herd. 2nd Lieutenant Luther Hare (left) (Custer in ’76 , p. 65) said he and the Rees rode down the valley while Reno was watering the horses (i.e., crossing river?) and the Rees took off from him about a mile down river. Private William Jackson (William Jackson, William Jackson, Indian Scout: His True Story Told by His Friend, , p.135) said scouts rode out ahead of Reno and turned straight down valley. 3:12: Benteen’s battalion walked past the lone tepee. 3:13: Reno’s battalion saw Custer’s battalion at Reno Hill. Custer’s battalion saw Reno charge the village. 3:15: Sgt. Daniel Kanipe left for Capt. Frederick Benteen and the pack train. 3:17: The pack train left the morass. 3:18: Reno’s battalion halted and formed a skirmish line. They saw Custer’s battalion on the bluffs, disappearing. Custer’s battalion passed Sharpshooter Ridge and entered Cedar Coulee. Reno’s attack/formation of skirmish line occurred about midday, probably 1:00 pm. 3:20: Little Sioux (Ree), Strikes Two (Ree), Red Star (Ree), Boy Chief (Ree), One Feather (Ree), Bull Stands in Water (Ree), and Whole Buffalo (Sioux) diverged from Reno’s charge and drove captured Sioux ponies up the bluff. They were joined there by seven stragglers who lagged behind on Custer’s trail and never crossed the Little Bighorn: Soldier (Ree), Stabbed (Ree), Bull (Ree), White Eagle (Ree), Red Wolf (Ree), Strikes the Lodge (Ree), and Charging Bull (Ree). If they left the column at 3:10 (above), how could they diverge from Reno’s charge at 3:20? 3:23: Custer’s battalion arrived at the bend of Cedar Coulee and halted. 3:24: Custer, his officers, Guide Mitch Bouyer (left) and Curley left the bend on a side trip to Weir Peak. 3:26: Three Crows left the halted command at the bend of Cedar Coulee (off-trail). Goes Ahead (The Teepee Book, 2.6, June 1916, p.604) says scouts were told to make their escape at the trenches of the Reno-Benteen site. 3:28: Custer’s party arrived at Weir Peak and saw the village and Reno skirmishing. 3:28.5: The three Crows halted on the bluff above Weir Peak. 3:30: 1st Lieutenant Charles DeRudio (left) saw Custer’s party at Weir Point. Custer’s party saw the concealed route to Ford B and the village. Not possible to identify individual and/or clothing on Weir from valley position. Who DeRedio saw remains open to question. 3:31: Custer and officers left Weir Peak to return to the command. The Arikara were fired on by the last of Custer’s column as it was disappearing over Weir (on the eastern edge), crossed Kanipe’s route, encountered stragglers left behind Custer’s column. Custer in ’76, 180-1; Arikara Narrative of Custer’s Campaign and the Battle of the Little Bighorn , 115-6. 3:32: The pack train passed the lone tepee. 3:32.5: Boston Custer passed Reno Hill. The Reno fight would have been visible for the next five minutes. 3:33: Reno withdrew the battalion into the timber. The three Crows saw Reno’s skirmish, fired at the Sioux, and left. 3:34: Custer returned to the halt at the bend from Weir Peak. Trumpeter John Martin (left) left Custer’s battalion at the bend of Cedar Coulee for Benteen. Custer started down Cedar Coulee. 3:36: Pony captors overtook and passed Sergeant Kanipe. 3:38: John Martin met Boston Custer at the head of Cedar Coulee. 3:39: The three Crows halted, had a drink in the Little Bighorn River, and captured five ponies. 3:40: John Martin saw Reno’s battalion fighting in the timber. 3:40:5: Benteen’s battalion met the Rees driving the Sioux ponies. 3:42: Sergeant Daniel Kanipe met Benteen’s battalion with a verbal message from Custer. 3:45: Little Sioux (Ree), Strikes Two (Ree), Red Star (Ree), Boy Chief (Ree), One Feather (Ree), Bull Stands in Water (Ree), Whole Buffalo (Sioux), Soldier (Ree), Stabbed (Ree), Bull (Ree), White Eagle (Ree), Red Wolf (Ree), Strikes the Lodge (Ree), and Charging Bull (Ree) drove the herd of Sioux ponies back to the packtrain and halted. Pretty Face (Ree) was with the packs until this time. 3:46.5: Custer’s battalion halted at the mouth of Cedar Coulee. 3:48: The pack train met Kanipe who had Custer’s message. 3:49: Boston Custer overtakes Custer’s battalion at the mouth of Cedar Coulee with news. The three Crows continued upriver. 3:52: Black Fox (Ree) (left) was at the bluffs and joined the three Crows who were given a Sioux pony. 3:53: Reno ‘s battalion began its retreat upstream. Girard (RCOI) puts this about 2:00. His watch, giving timing of sunrise near 4:00 a.m. local time and full dark at 9:00 p.m., reflects local time fairly closely. Additionally, Girard’s watch times closely match the captured Rosebud watch timing the entire fight from skirmish line to the surround on Reno Hill from 1-4. It is, per Hardorff, extremely unlikely that Crook, who was headquartered in Omaha, would have set his command watches to San Francisco time. Headquarters is where the general is, and the general had been in the field (Douglas, Wyoming, approximates headquarters) for more than a year. Headquarters time is what the general says it is–why set watches an hour and a half off daybreak, noon? 3:55: Rees switched to fresh Sioux ponies and started back to Reno. Custer’s battalion saw signals by Mitch Boyer and Curley on Weir Ridge. 3:56.5: Custer’s battalion started down Medicine Tail Coulee. 3:58: Benteen’s battalion met Trumpeter John Martin at the flat where they heard firing. The three Crows passed Reno Hill and saw Reno’s retreat. 4:00: Reno’s battalion retreats across the Little Bighorn River. Bobtail Bull (Ree) and Little Brave (Ree) (left) had been killed on the east bank by this time. 4:02: Benteen’s battalion took Custer’s trail at the North Fork. 4:04: Custer’s battalion halted in Medicine Tail Coulee where Boyer and Curley joined them. 4:04:5: The packtrain was overtaken by the Rees who were returning to Reno Hill. 4:05: Young Hawk’s party was trapped on the east bank bottom by the Sioux and fought. Scout George Herendeen‘s party scrambled back to the timber from the retreat. 4:06: Benteen’s battalion saw Reno’s retreat at the knoll and halted. 4:08: Captain George Yates‘ battalion (Companies F and E, off-trail) left the separation halt down Medicine Tail Coulee. Custer’s battalion (Companies C, I, and L) left the separation halt north out of Medicine Tail Coulee. 4:10: Benteen’s battalion met three Crows and one Ree and left the halt. Reno’s battalion climbed the bluffs obliquely to Reno Hill. Private William Baker (1/2 Ree), Private William Cross (Ree, 1/2 Sioux), Red Bear (Ree horse herder), White Cloud (Sioux rear guard), Ma-tok-sha (Sioux), and Caroo (Sioux) arrived at Reno Hill. Red Bear and White Cloud left to join the pony captors. Herendeen’s party met 12 troopers who had been left in the timber. 4:15: Red Bear and White Cloud met three Crows and Black Fox and halted to await the return of the Crows. 4:16: Custer’s battalion arrived on Luce Ridge and halted on the defensive position. 4:18: Yates’ battalion arrived at Ford B. Light firing over the Little Bighorn began. Custer’s battalion saw and heard the firing. 4:23: Yates’ battalion crossed Deep Coulee and arrived on the cutbank unopposed. Custer’s battalion saw Yates start up the west rim of Deep Coulee. 4:25: Red Bear and White Cloud left for Reno Hill when the Crows failed to return. Custer’s battalion pinned down the Sioux with heaving firing. Young Hawk‘s party and Herendeen’s party heard heavy Custer firing downstream. Reno left in search of 2nd Lieutenant Benjamin Hodgson‘s body. 4:27: The pack train halted at the flat to close up. 1st Lieutenant Edward Mathey sighted smoke. Custer’s battalion left Luce Ridge to meet Yates downstream. 4:30: Black Fox arrived at Reno Hill. Red Bear and White Cloud arrived for the second time. Young Hawk’s party and Herendeen’s party saw the Sioux leave the upper valley. The three Crows arrived at Sharpshooter Hill and heard Custer’s battalion firing. 4:32: Little Sioux, Strikes Two, Red Star, Boy Chief, One Feather, Bull Stands in Water, Whole Buffalo, Soldier, Stabbed, Bull, White Eagle, Red Wolf, Strikes the Lodge, Charging Bull, and Pretty Face returned to Reno Hill with the ponies from the lone tepee and were greeted by Red Bear and White Cloud. Custer’s battalion arrived at Nye-Cartwright Ridge. 4:33: Yates’ battalion ascended the west rim of Deep Coulee. The Sioux attacked its flanks. 4:38: Custer’s battalion fired at the Sioux on their left flank while negotiating a crossing of upper Deep Coulee. 4:40: Three Crows arrived at Reno Hill, reporting to Red Star that two Crows were killed. 4:45: Young Hawk’s party left for Reno Hill. Three Crows left for their home village. 4:46: Yates’ battalion fought on foot to the reunion point. Custer’s battalion joined Yates. 4:47: The packtrain left the flat and saw the troops on Reno Hill. 4:50: Reno returned from his search for Hodgson and talked with 2nd Lieutenant Charles Varnum. Curley left Custer’s battalion for the mouth of the Bighorn. 4:52: Reno dispatches 2nd Lieutenant Luther Hare to speed up the ammunition mules. 4:55: The sound of Custer’s volleys prompted Captain Thomas B. Weir (left) to ask to move downstream. 4:57: The packtrain was at the North Fork and took Custer’s trail. 12:30: The main column left the Busby camp on a night march under Lieutenant Colonel George Custer. 2:50: 1st Lieutenant Charles Varnum (left) and scouts arrived at a pocket below the Crow’s Nest. 3:15: The main column arrived at Halt 1 on Davis Creek where it was still dark. Local time was Mountain Standard Time minus 13 minutes to allow for sun transit at 12:13 at Busby and Crow Agency, Montana Territory. On a clear, moonless night, the first streaks of day appear at 1:55 local time. A pocket watch like that which belonged to 2nd Lieutenant George Wallace could be read at 2:45 a.m. It was daylight at 3:00 [Reno Court of Inquiry: Proceedings of a Court of Inquiry in the Case of Major Marcus A. Reno (RCOI): Wallace, Captain Myles Moylan, Captain Frederick Benteen]. Visibility was clear to the horizon by 3:18 although you could not read print until 3:30. (All based on personal observation from divide.) Wallace’s Official Report stated the night march ended about 2:00 (Federal View, p. 65). 1st Lieutenant Edward Godfrey (The Godfrey Diary of the Battle of the Little Bighorn, p. 10) halted the night march about 2 o’clock (RCOI, Scout George Herendeen) and marched until probably 2:00. “As soon as the first faint streaks of daylight appeared, we moved into a grove where we were ordered to unsaddle and rest for several hours” (Peter Thompson’s Narrative of the Little Bighorn , p. 95). 3:40: Two Crows saw the Sioux village at the Little Bighorn for the first time. From accounts by Red Star (later known as Strikes the Bear) and Little Sioux, this could have been as early as just after 3:00 a.m. Easily visible by 3:00 local time–personal observation. 3:50: Varnum was awakened for the climb to the peak. Not later than 3:15 since Varnum (Northwestern Fights and Fighters , p. 340) said he got to the Crow’s Nest about 2:30, slept 45 minutes and was awakened when it was just daylight, probably closer to 3:00 a.m.
4:00: Varnum and the scouts study the village in the Little Bighorn Valley. 5:00: Varnum and the scouts saw the breakfast smoke at the Halt 1 camp. 5:20: Varnum sent two Ree scouts with a note to Custer who was still at Halt 1. It was possible for Varnum to have sent the messengers significantly earlier; e.g., 4.30 a.m. Varnum in Northwestern Fights and Fighters said 4:45 or 5:00. Translated to local time that is closer to 3:30, more likely since Interpreter Frederick Girard (left) and the Ree scouts say Custer got Varnum’s message at 4:00 or when the sun was just rising = 4:09 local time. Note that Gray’s use of “Halt 1” can be/is somewhat confusing since Wallace uses “Halt 1″ to refer to the halt at the divide and ” Halt 2″ to identify the halt over the divide when Benteen was sent to the left. I now think it possible Varnum was using headquarters time so he sent the messenger at 3:40 a.m. This fits with the messenger arriving as reported by the Rees as the sun was rising at 4:13 a.m.
5:40: The Crows saw two Sioux west of the Divide. 6:20: Varnum led a sortie against the two Sioux. 6:40: Varnum returns to the Crow’s Nest, unsuccessful. 7:10: The scouts saw two Sioux crossing the divide. 7:20: The two Ree couriers arrived at the Halt 1 camp from the Crow’s Nest. The assumption that the main courier travelled so slowly (less than 3 mph) is very doubtful and the journey time could easily be half the 2 hours claimed here. Cf. note above Girard and the Rees put it at 4:00-4:09 (Girard in Once Their Home , p. 263; Arikara Narrative of Custer’s Campaign and the Battle of the Little Bighorn , p. 149). 7:30: Custer read Varnum’s note, indicating that a village had been spotted in the Little Bighorn Valley. 7:45: Sergeant William Curtiss left the Halt 1 camp on the back trail in search of a lost pack. 8:05: Custer’s party was spotted by two Sioux as seen from the Crow’s Nest. Varnum saw two Sioux meeting Custer’s party. 8:25: Curtiss party sights Cheyennes rifling through the lost pack. 8:45: Command under Reno departed Halt 1 camp and moved toward the Crow’s Nest. I now think the column marched at 7:25 a.m. under Captain Tom Custer and met the irate George Custer on his return from the Crow’s Nest as he had ordered the column to stay put (see various Girard accounts). 9:00: Custer’s party arrived at the Crow’s Nest. 9:00+: Custer studied the valley and discussed the findings. 10:07: Custer and the scouts watched the command arrive at the Halt 2 camp on Davis Creek for concealment. 10:20: Custer’s party left the Crow’s Nest with Varnum’s party. Curtiss’ party arrived at the Halt 2 camp and reported seeing the Cheyennes with the lost pack. 10:30: Custer and the scouts are met by Captain Thomas Custer with Sergeant Curtiss’ news. 10:35: Custer-Varnum party arrived at the Halt 2 camp. Cheyennes were spying. There is some evidence (1st Lieutenant Charles De Rudio, 2nd Lieutenant Luther Hare in Custer in ’76: Walter Camp’s Notes on the Custer Fight ) that Custer made a second visit to the Crow’s Nest; the time taken for this would not be more than 30 minutes if Halt 2 was near the Crow’s Nest. 10:50: At officer’s call, Custer decided they will attack. Benteen (RCOI) and Edgerly (Custer Myth, pp. 216, 219) put officers’ call at 10:00, after Custer had been on the Crow’s Nest for about an hour (Research Review, 1986). See also Donohue in Fatal Day, pp. 20-21. Herendeen very early therefore very reliable put it between 10:00-10:30 (Custer Myth, p. 280). 11:45: Command under Custer departed Halt 2 camp and moved down Davis Creek. This departure time assumes the command halted within 0.75 mile of the Divide. It is likely that they were actually at least twice as far as this since participants reported the column as being concealed in a ravine. This would pull forward the departure time by 15 minutes or so. Hare, DeRudio, Varnum agreed that the column was halted 1/4 to 1/2 mile east of the divide. George B. Herendeen (left) died on June 17, 1919, in Havre, Montana, and was buried in Harlem Cemetery in Harlem, Montana. He was a Scout who participated in the valley and hilltop fights. Henry James Nowlan was born on June 18, 1837, on the Corfu Ionian Islands. He was a First Lieutenant with the Quartermaster who was not present at the battle due to detached service. Ferdinand Klawitter was born in Conitz, Berlin, Germany, on June 19, 1836. He was a Private with Company B who was not present due to detached service. Charles William Larned (left) died on June 19, 1911, in Danville, New York, and was buried in the United States Military Academy Post Cemetery at West Point, New York. He was a Second Lieutenant with Company F who was not present at the battle due to detached service. Charles Albert Varnum (right) was born in Troy, New York, on June 21, 1849. He was a Second Lieutenant in Company A who commanded the scouts. He participated in the valley and hilltop fights and was wounded. Luther Rector Hare married Virginia Hancock on June 21, 1878. He was a Second Lieutenant with Company K who participated in the valley and hilltop fights. Frank K. Lombard died in San Diego, California, on June 21, 1917. His burial location remains unknown. He was a Private with the Band and was not present at the battle. George Custer (right) met with General Alfred Terry and Colonel John Gibbon aboard the steamer Far West on June 21, 1876. Frederick William Benteen (left) died on June 22, 1898, in Atlanta, Georgia. He was originally buried in the Westview Cemetery in Atlanta but was reinterred in Arlington National Cemetery in November 1902. He was the Captain of Company H who commanded a battalion during the battle. He led a scouting party and was wounded during the hilltop fight. Charles H. Welch died in LaSalle, Colorado, on June 22, 1915, and was buried in the Evans Cemetery in Evans, Colorado. He was a Private in Company D who participated in the hilltop fight. He was awarded the Medal of Honor for his actions during the battle. Carl August Bruns was born on June 23, 1830, in Brunswick, Germany. He was a Private with Company E who was not present at the battle due to detached service. John Brightfield was born in Dearborn County, Indiana, on June 23, 1853. He was a Private with Company C who was killed with Custer’s Column. 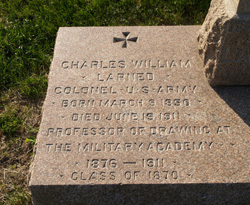 Charles William Larned died on June 19, 1911, in Danville, New York, and was buried in the United States Military Academy Post Cemetery at West Point, New York. He was a Second Lieutenant with Company F who was not present at the battle due to detached service. Charles Albert Varnum was born in Troy, New York, on June 21, 1849. He was a Second Lieutenant in Company A who commanded the scouts. He participated in the valley and hilltop fights and was wounded. Frederick William Benteen (left) died on June 22, 1898, in Atlanta, Georgia. He was originally buried in the Westview Cemetery in Atlanta and was reinterred in Arlington National Cemetery in November 1902. He was the Captain of Company H who commanded a battalion during the battle. He led a scouting party and was wounded during the hilltop fight. Fred Stressinger was born on June 24, 1852, in Ripley County, Indiana. He was a Corporal in Company M who was killed in the valley fight.